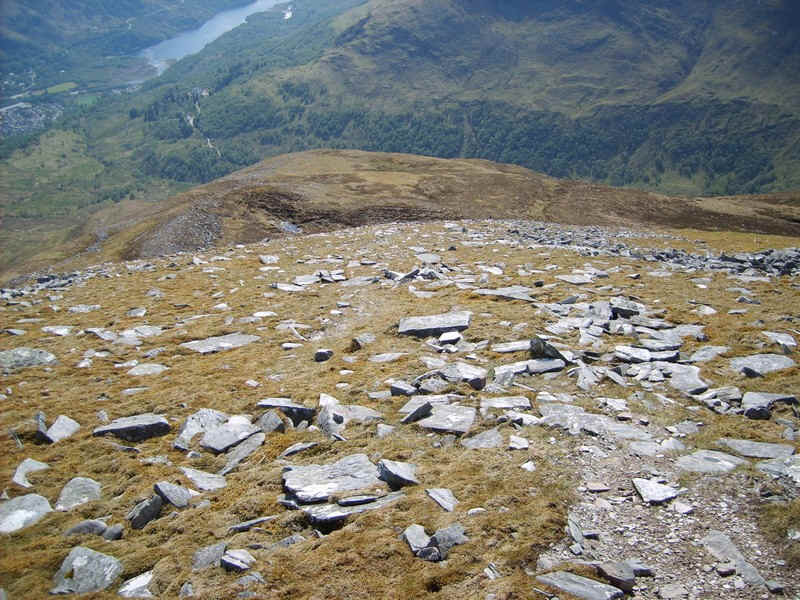 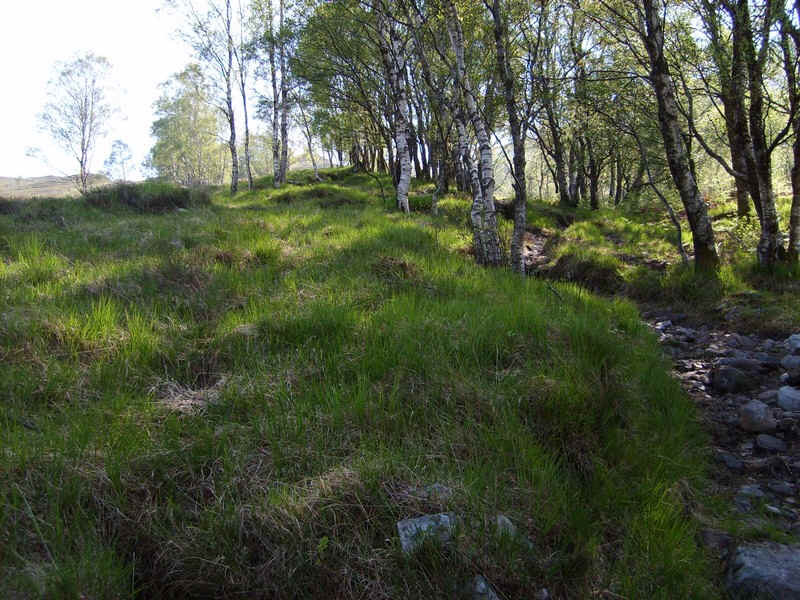 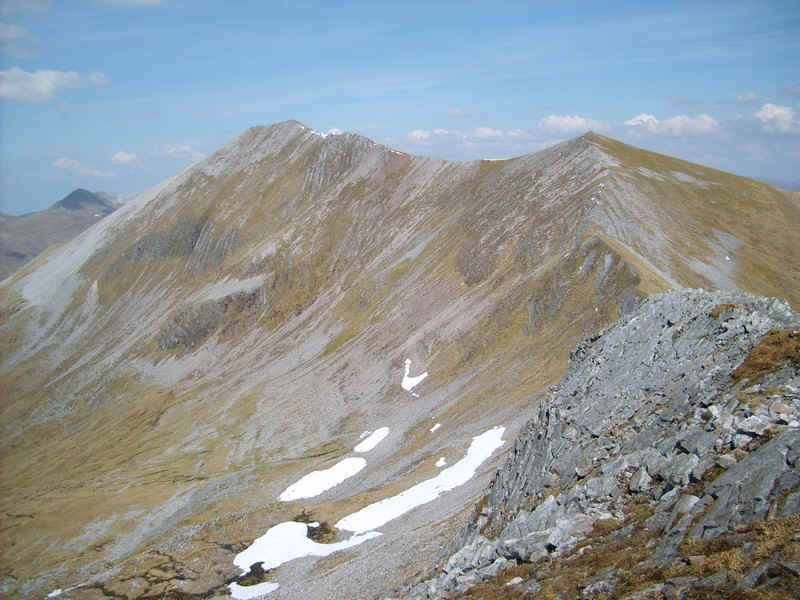 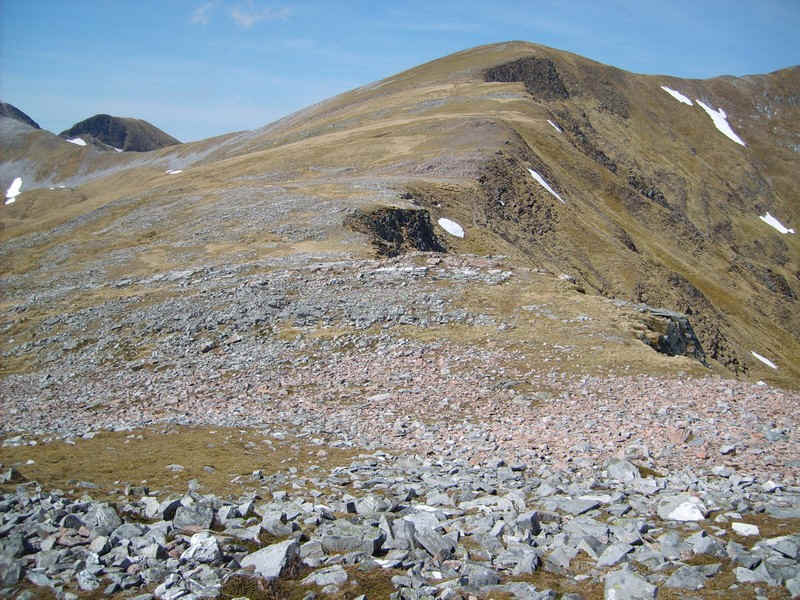 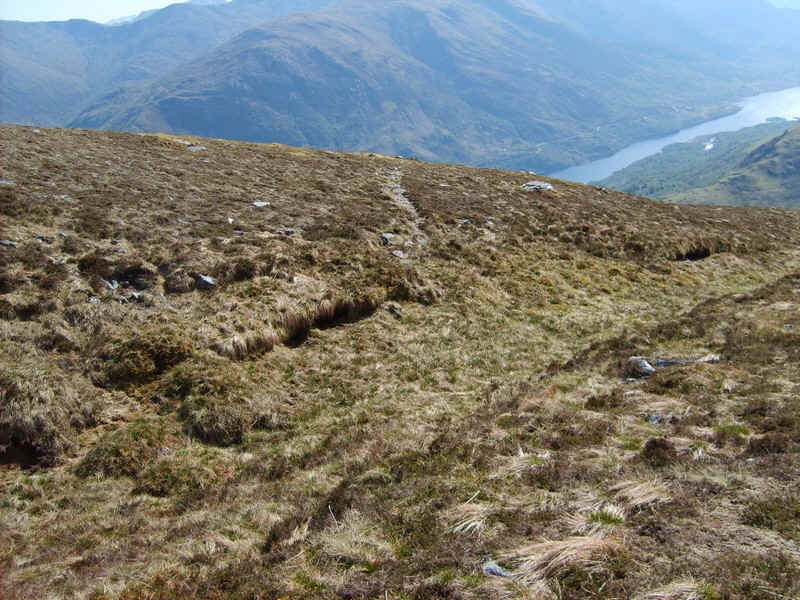 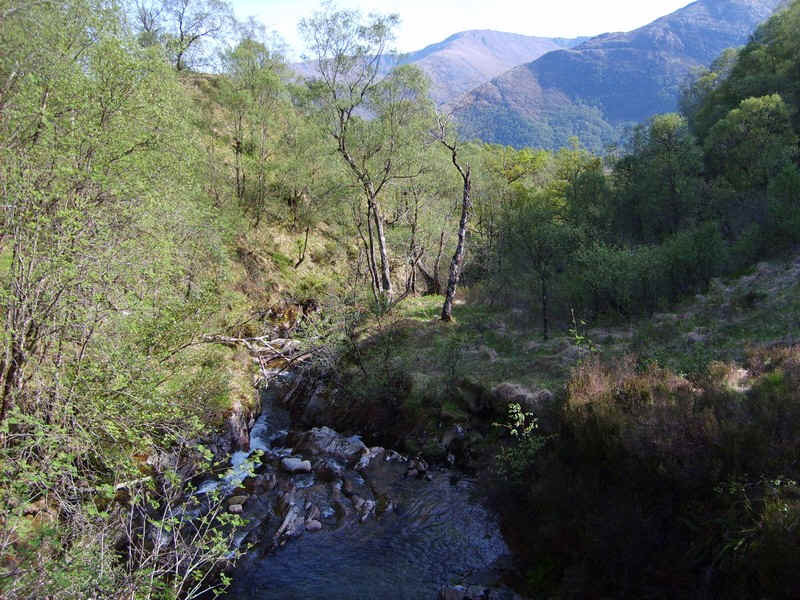 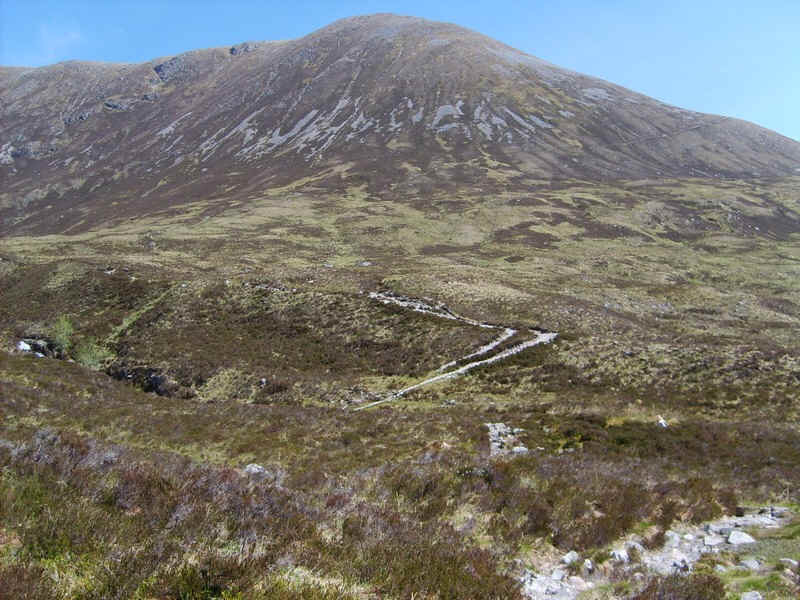 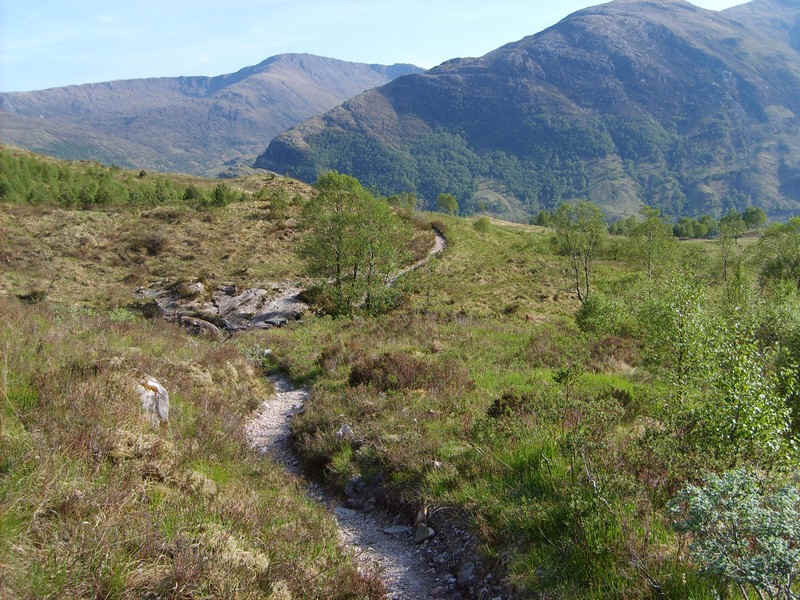 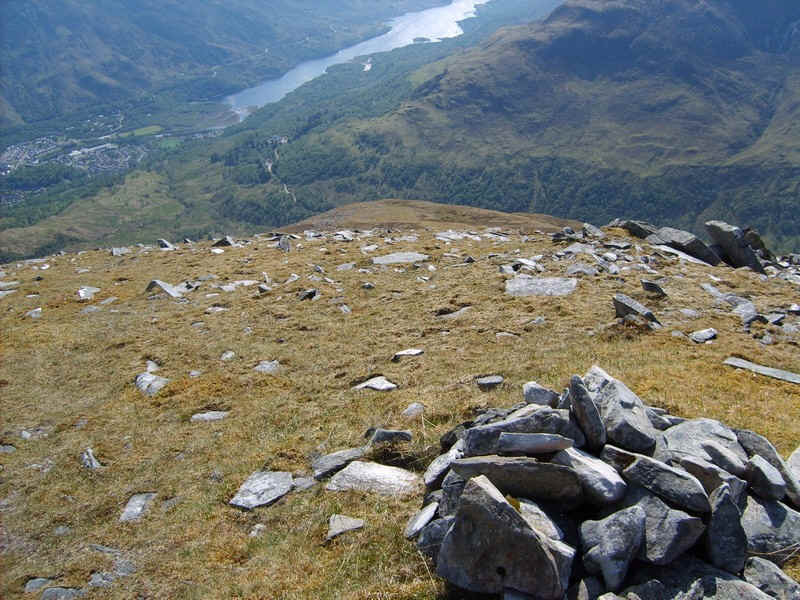 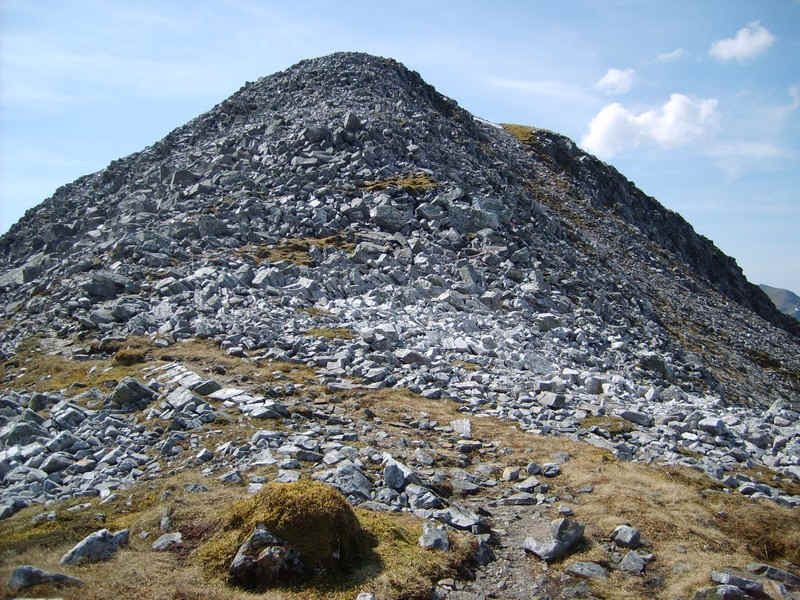 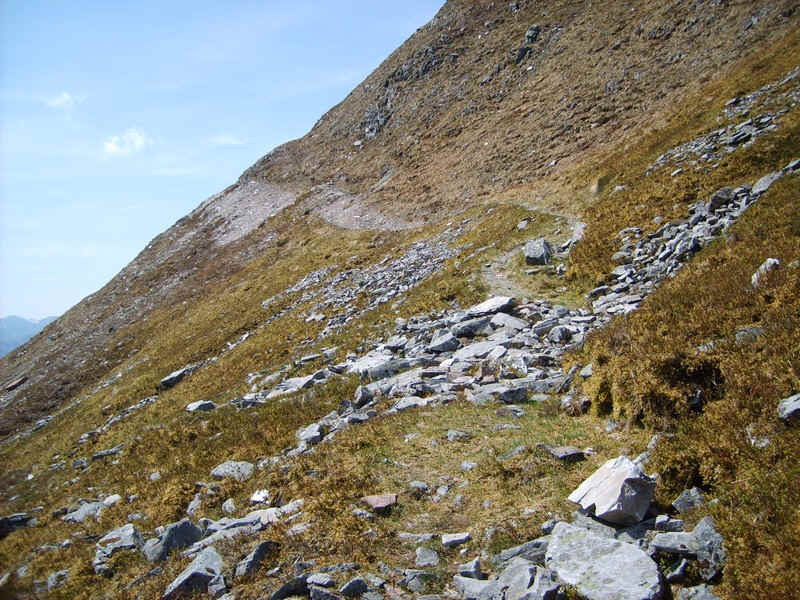 For my third day's walk from Kinlochleven, in May 2012, I decided to climb the last two hills in the Mamore group that I hadn't climbed - Binnein Mor and Na Gruagaichean. 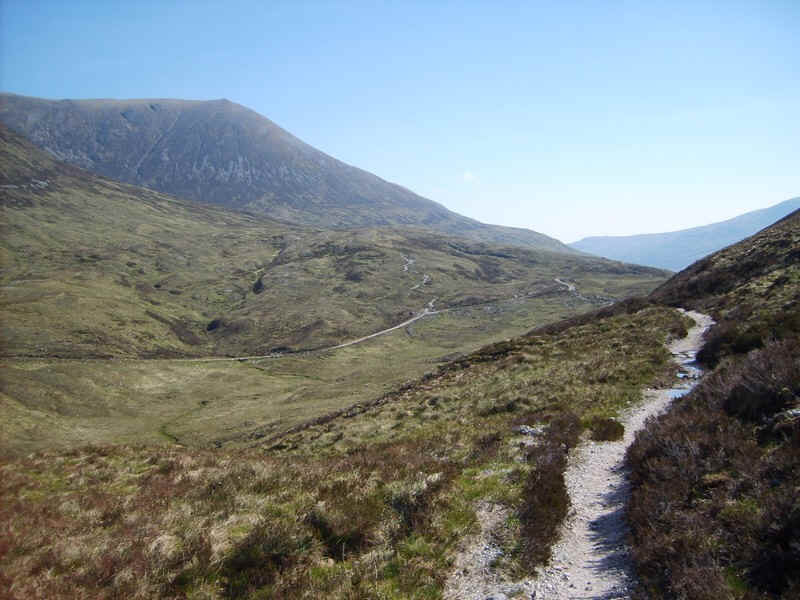 ....with the red way mark signs pointing the way to the hills. 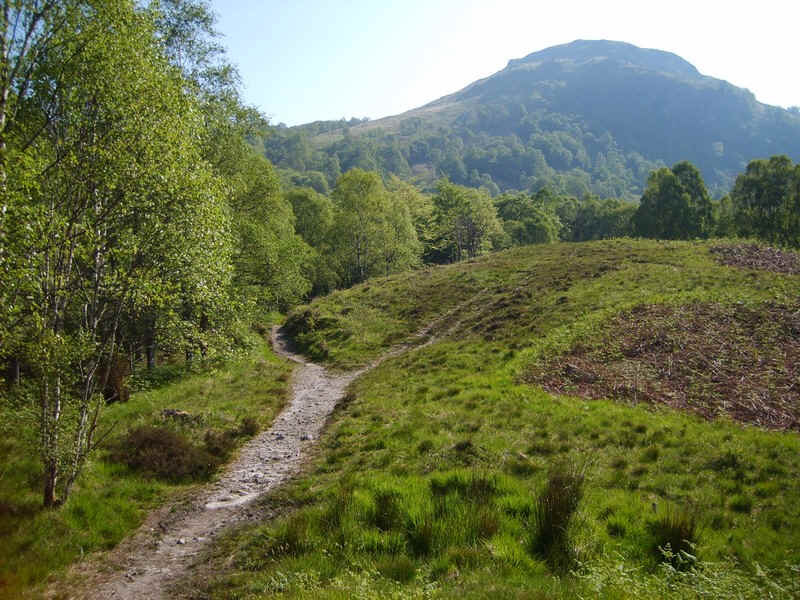 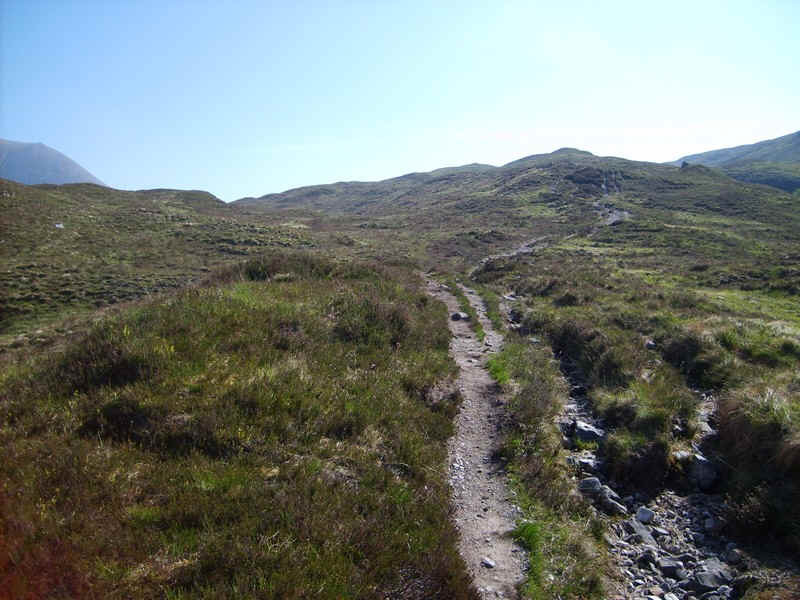 It is an extremely rough track in places and not the most pleasant climbs on a hot morning. 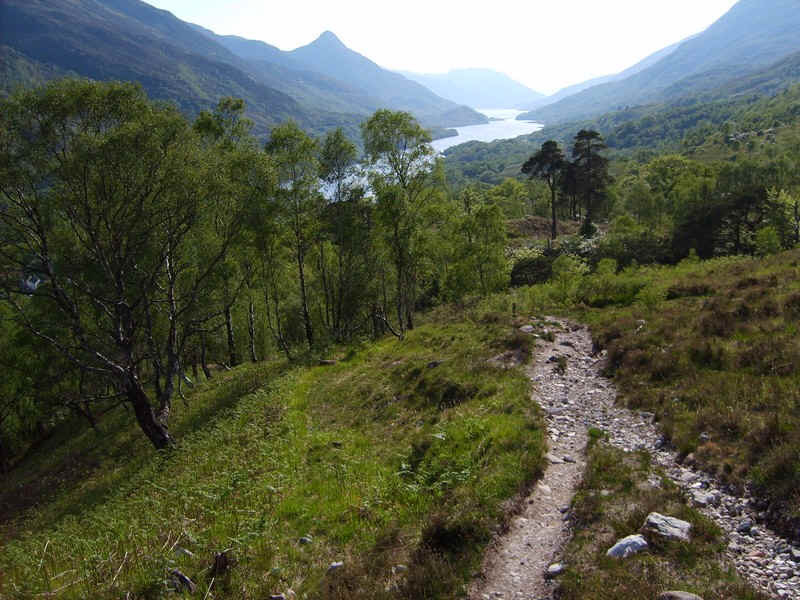 The reward is this view back down Loch Leven. 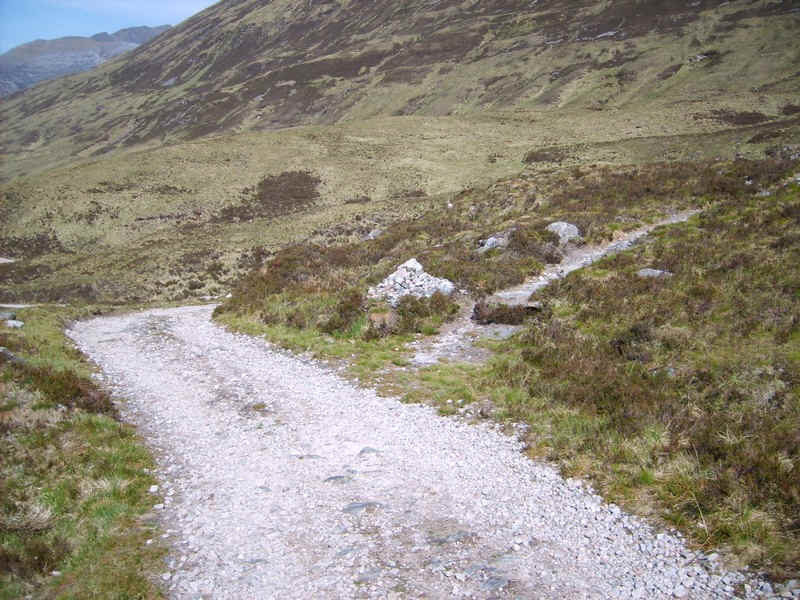 ....and there's a smooth and almost level path that leads towards the vehicle track from Mamore Lodge. 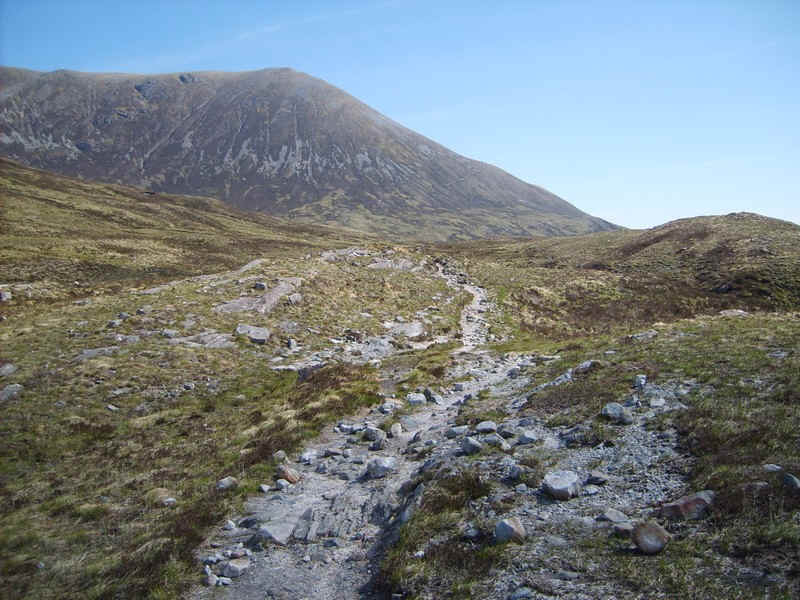 .....and starts to climb towards the slopes of Sgor Eilde Beag, the day's first objective. 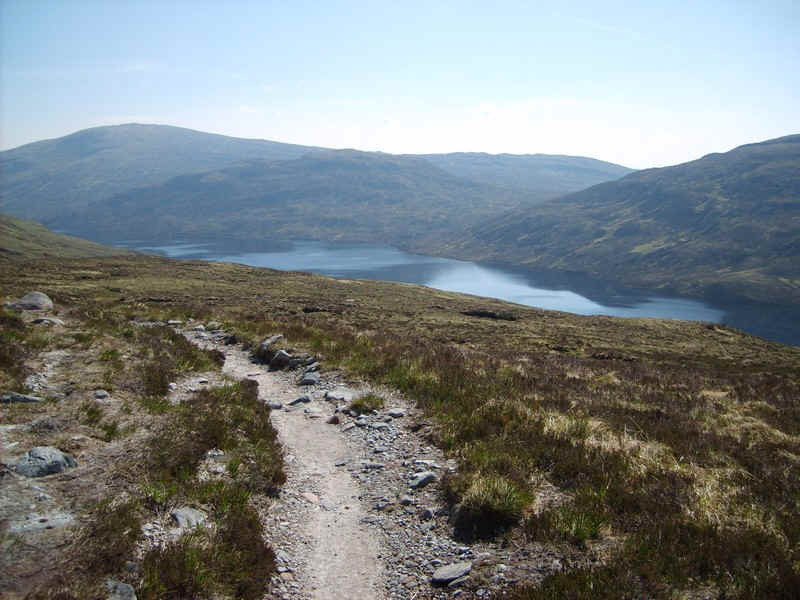 Over to the south is Loch Eilde Mor. 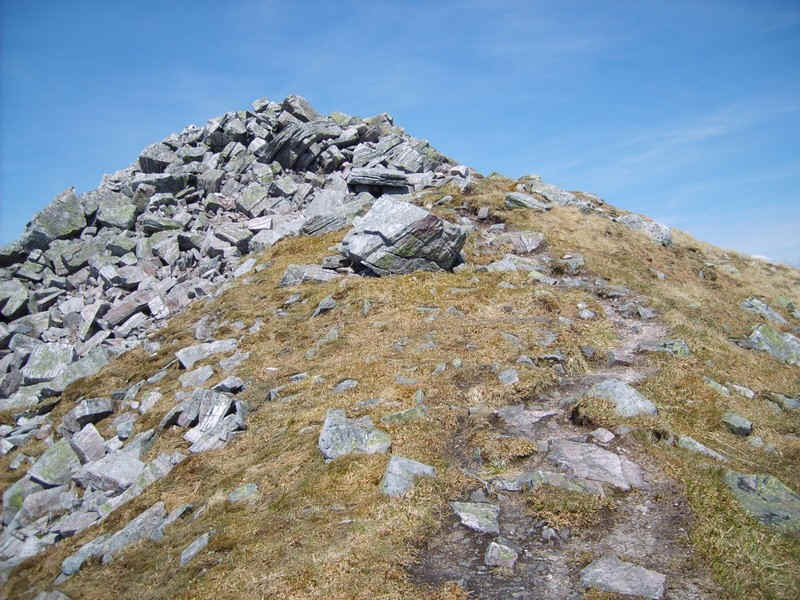 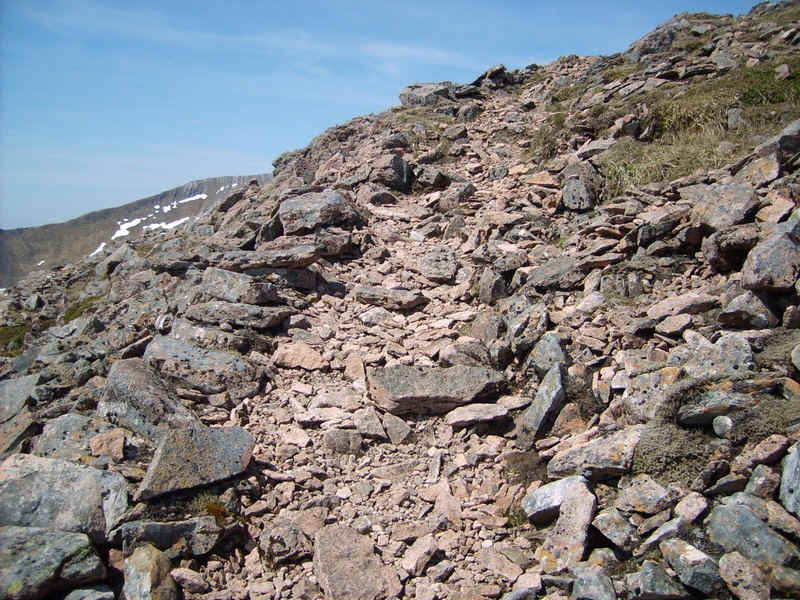 ......to reach a cairn where a path leads off to the left. 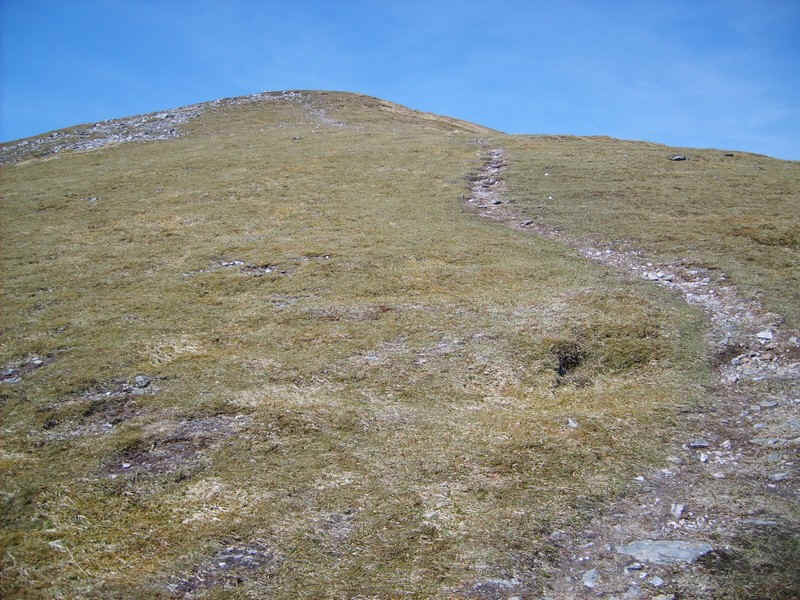 The path doubles back uphill in a series of zig zags at this point. 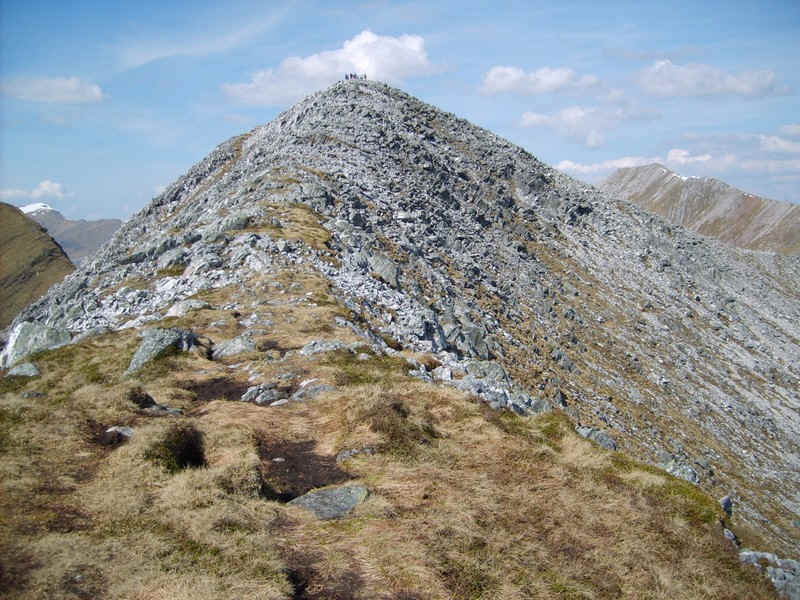 Ahead can be seen Sgurr Eilde Mor. 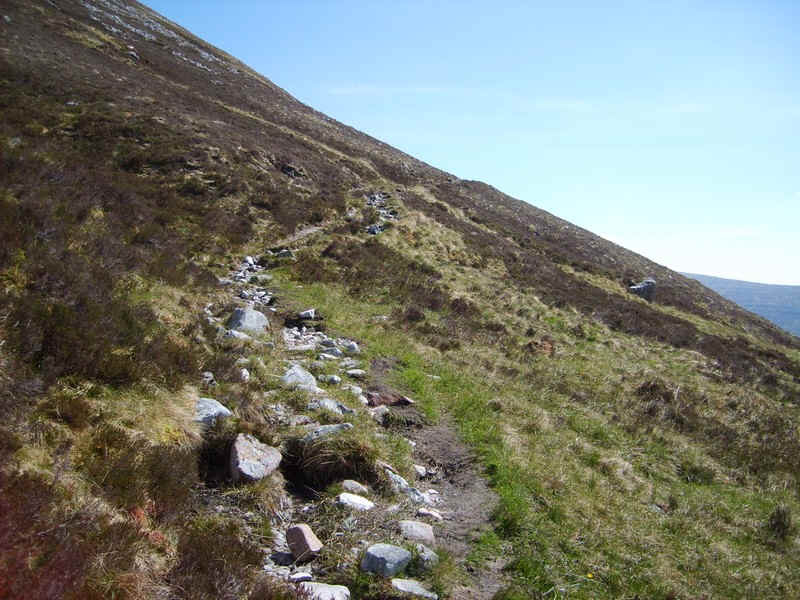 A rough track leads off up hill to the left away from the main path - this cuts off a corner but I decided to continue a little further..
.....to a cairn where the main stalker's path to Sgor Elide Beag trails in. 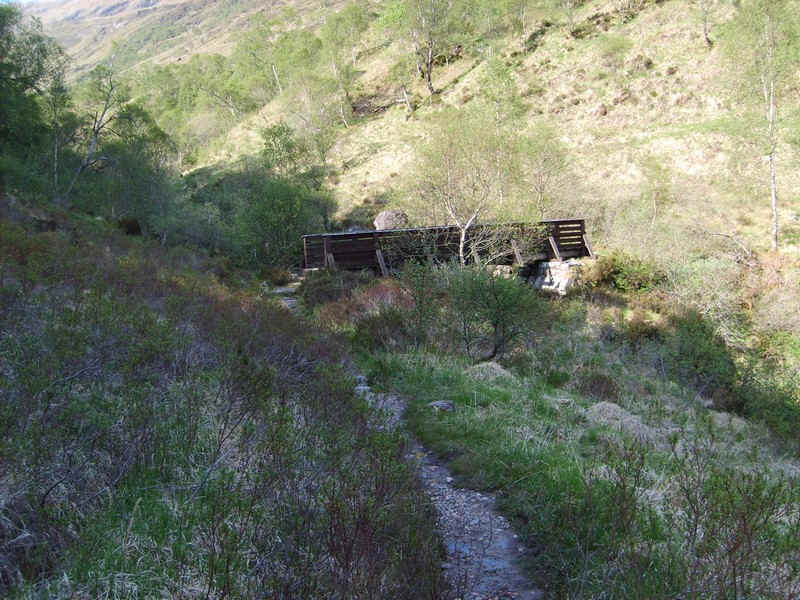 .....to arrive at this cairn which marks the beginning /end of the switchback section. 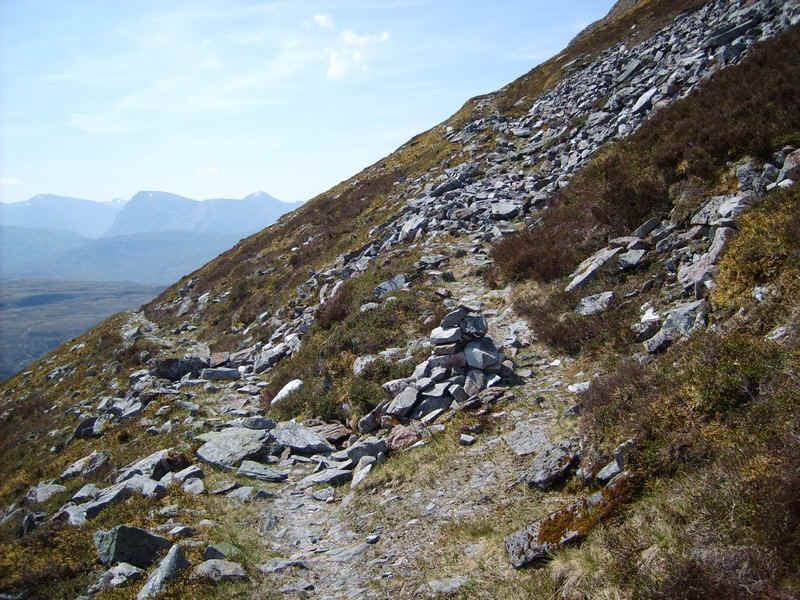 Beyond the path climbs over stones..
.....to reach the end of the ridge leading to Binnein Beag. 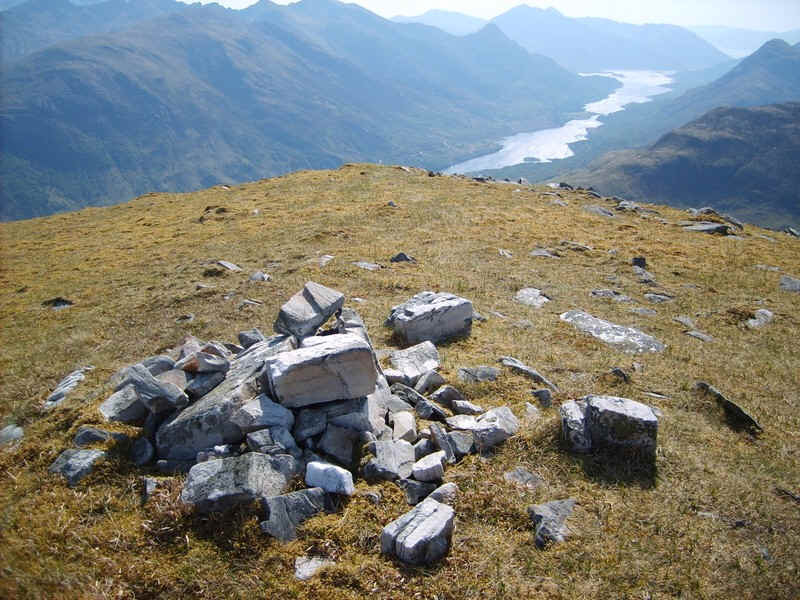 This isn't the 956m summit of Sgor Elide Beag but makes an excellent spot for a lunch break. 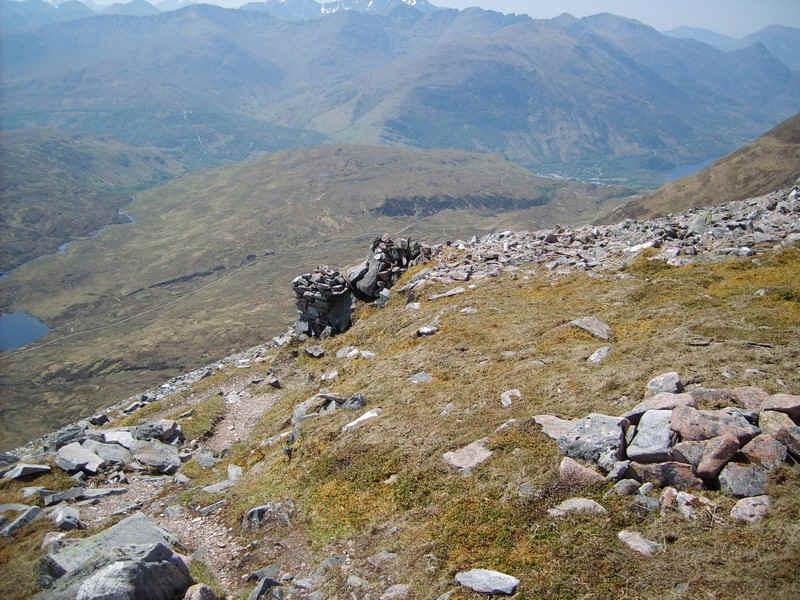 Ahead is this panorama of the rest of the day's high level walk. 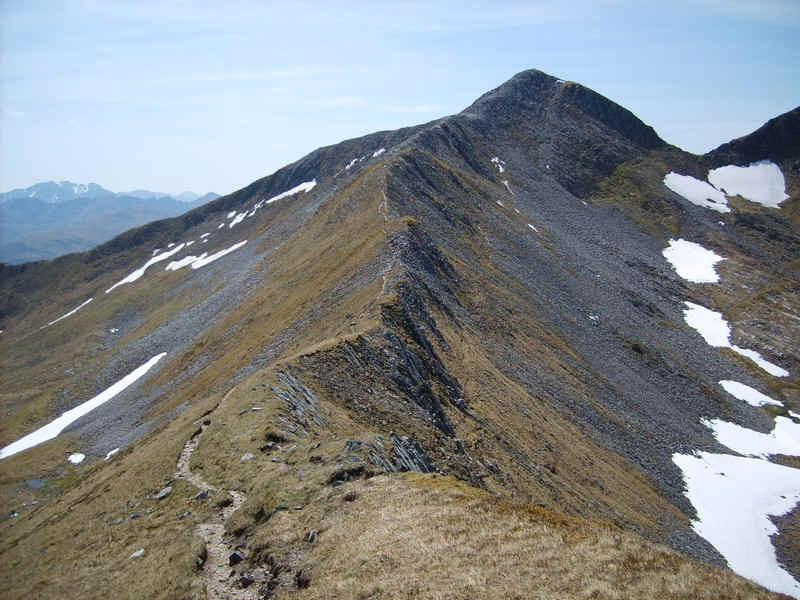 Over to the left is Na Gruagaichean, whilst in the middle is the 1062m south top of Binnein Mor and on the right the 1130m summit of Binnein Mor itself. 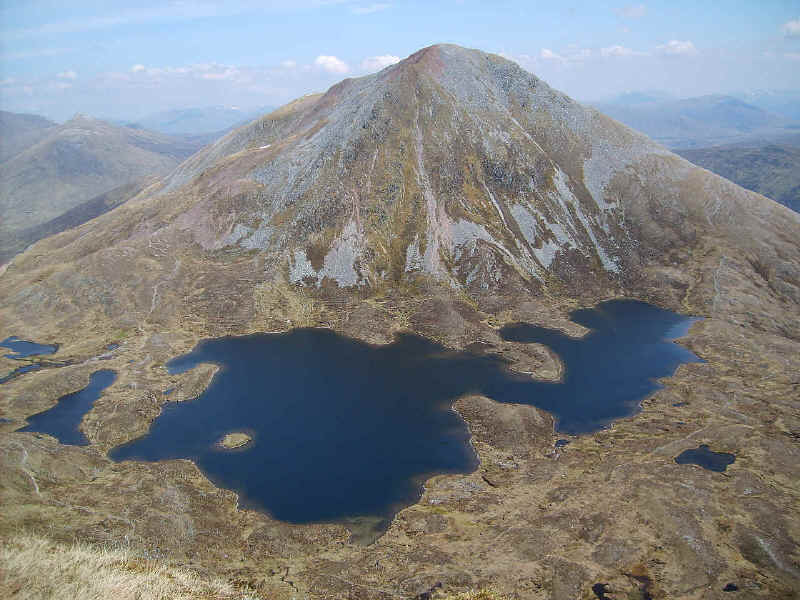 There's almost a helicopter view of Sgurr Elide Mor and the lochans in Coire an Lochain. 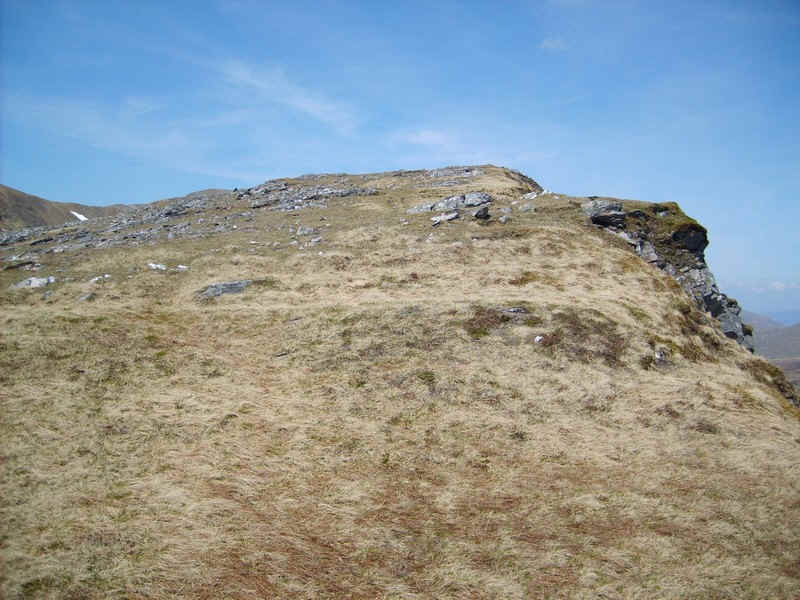 The photo was taken from the edge of the cliffs on Sgor Elide Beag. 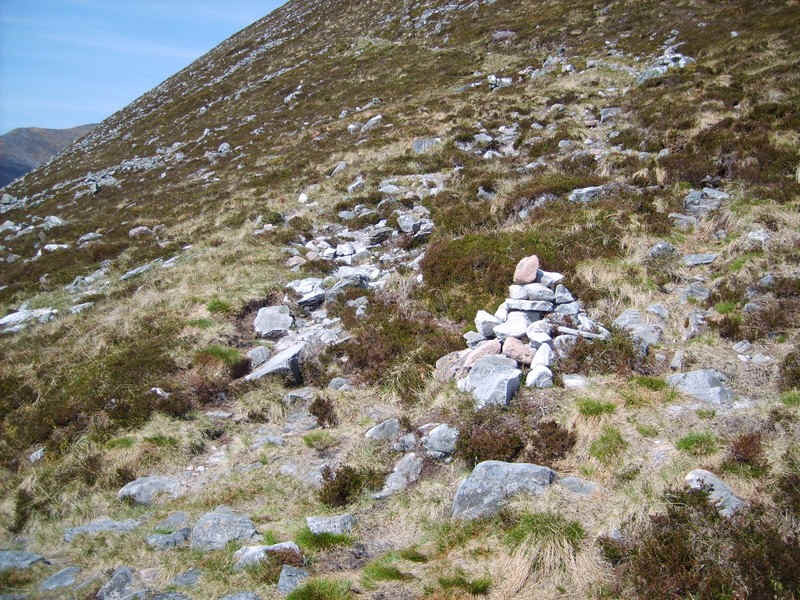 .....but the cairn is perched on the edge of a big drop to the east. 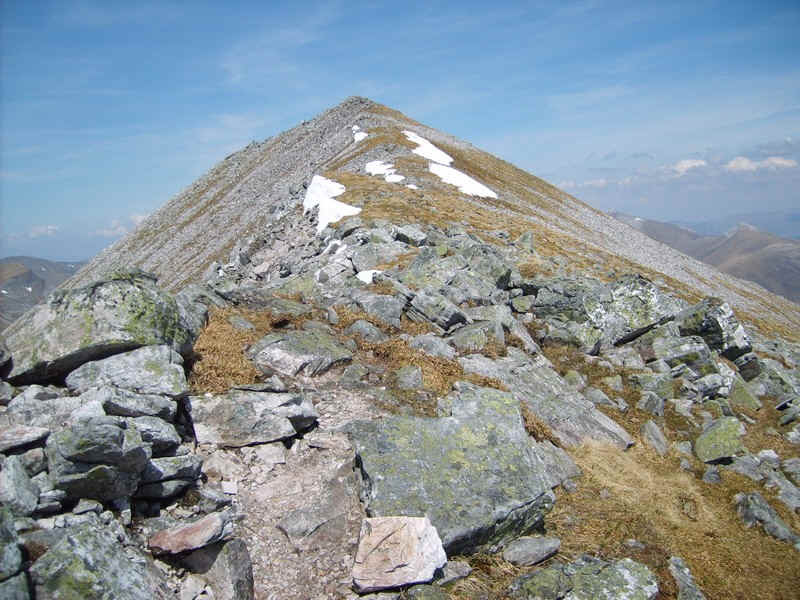 .....followed by a clear path that leads to the south top of Binnein Mor. 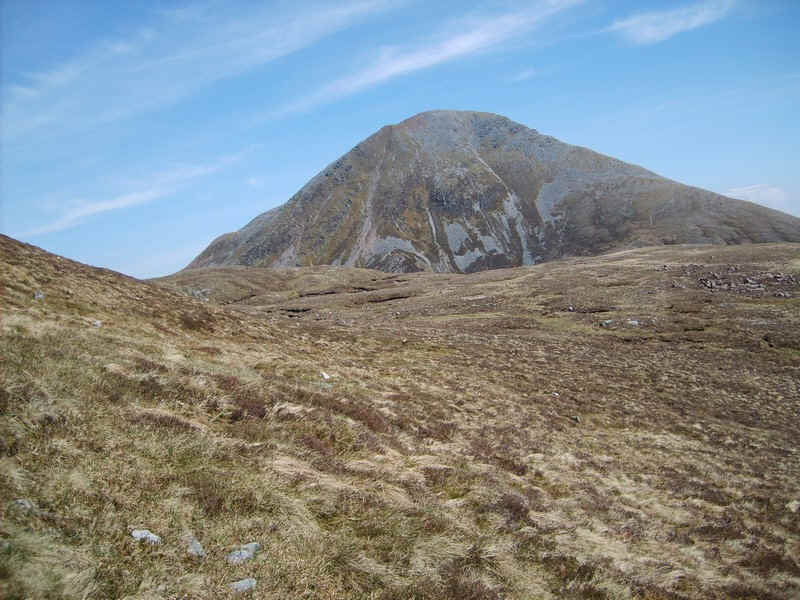 The view back shows the crags along the east side of Sgor Elide Beag. 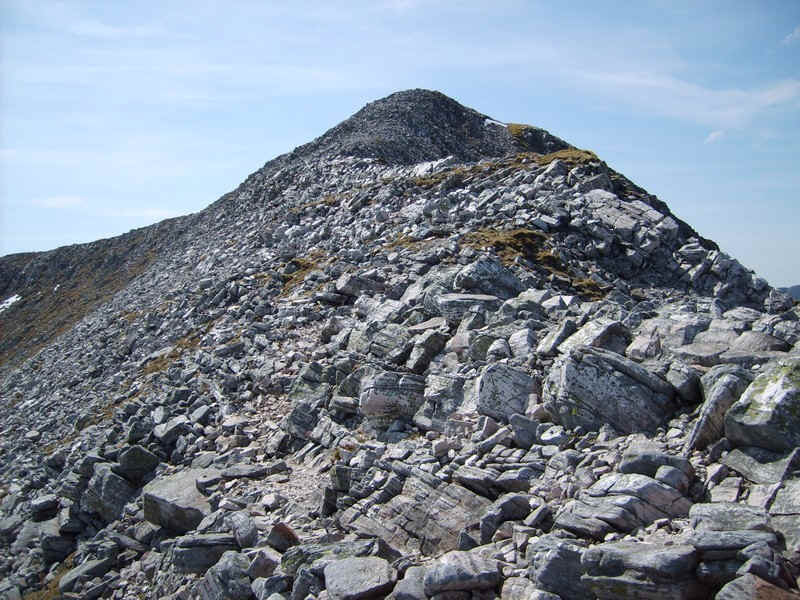 It's an easy walk up to the south top..
.....with its small cairn and a view of the ridge out to the summit of Binnein Mor. 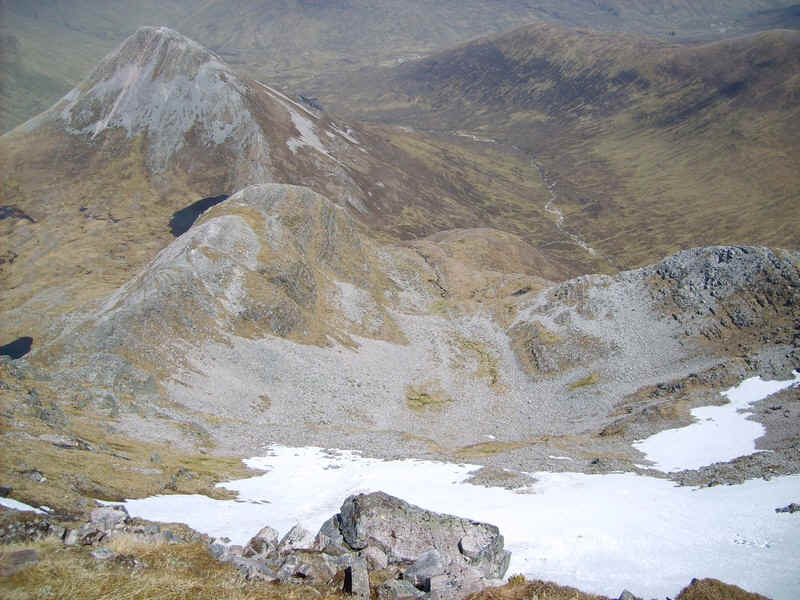 The remnants of the recent snow were still lying in places. 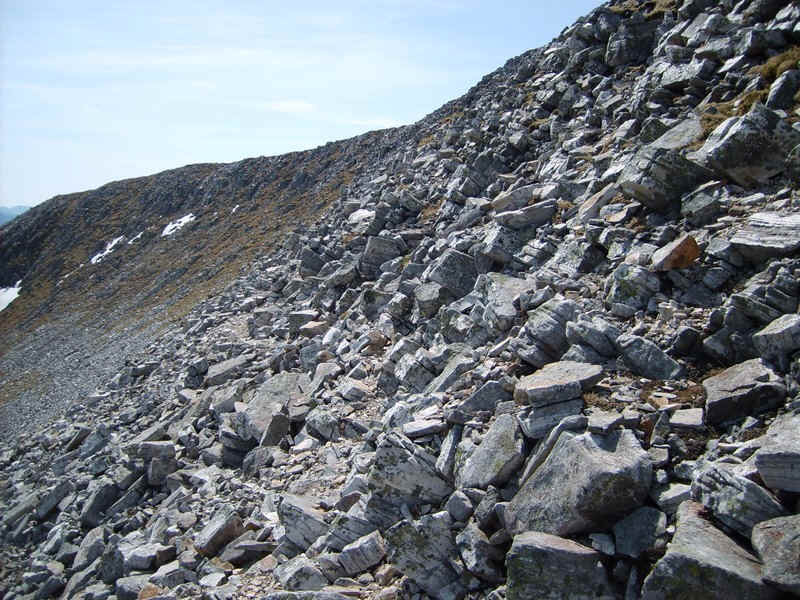 ......and the narrow bouldery summit ridge. 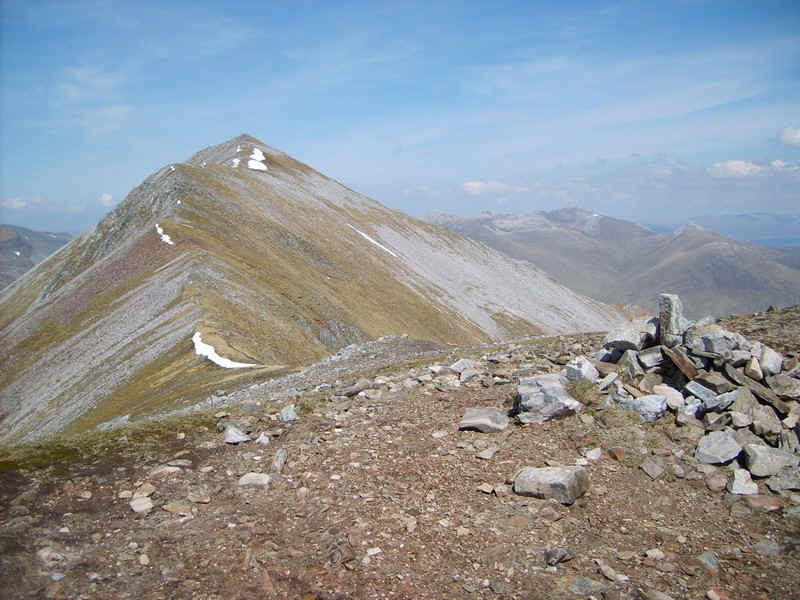 The first panorama is over to the west showing the summits (from left to right) of Na Gruagaichean, Am Bodach, Stob Stob Coire a'Chairn, Sgorr an lubhair and An Gearanach. 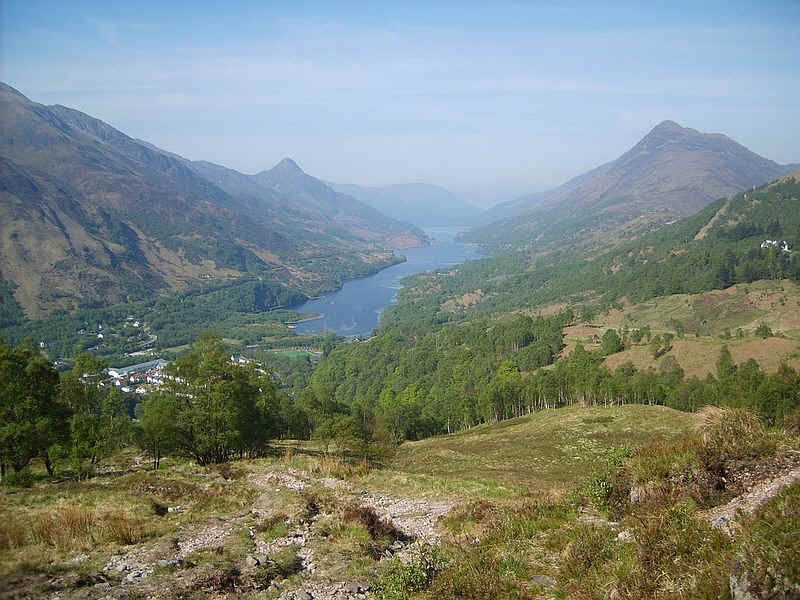 On the right hand side is Glen Nevis with Ben Nevis and Carn Mor Dearg beyond. 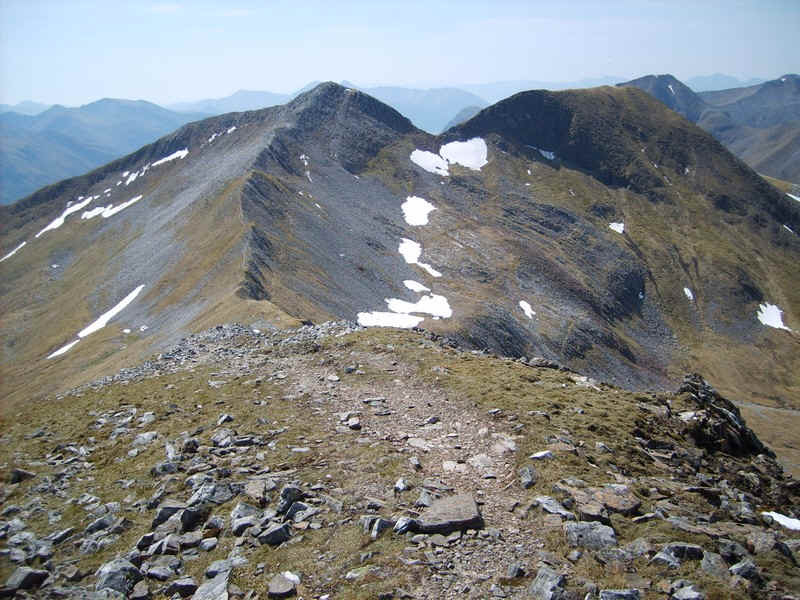 Over to the east (from left to right) are the Grey Corries, with Binnein Beag in front of them. 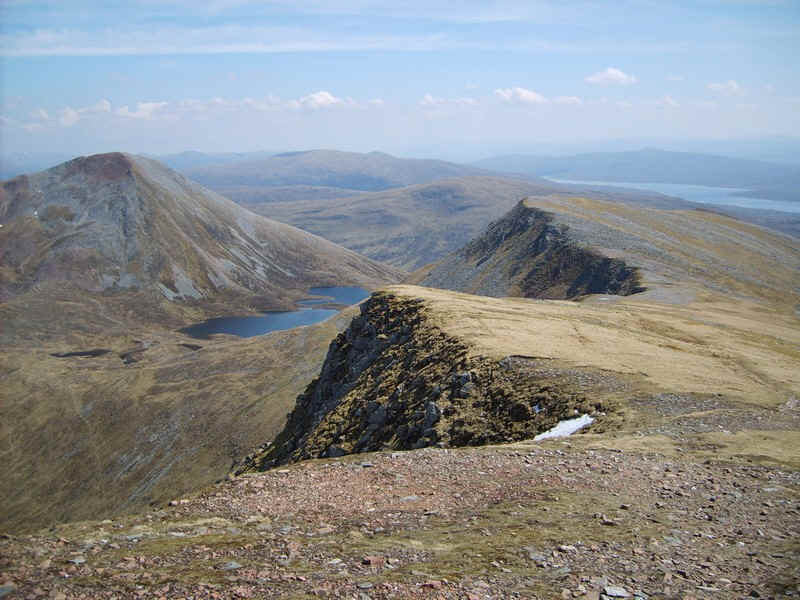 To the right is Sgurr Elide Mor and the lochans in Coire and Lochain. 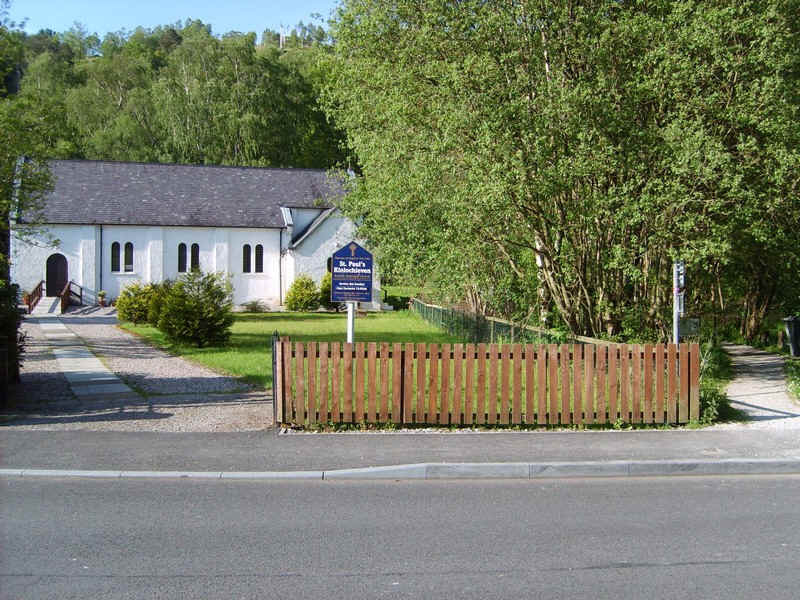 Click on the image for a full sized panormaic diagram. 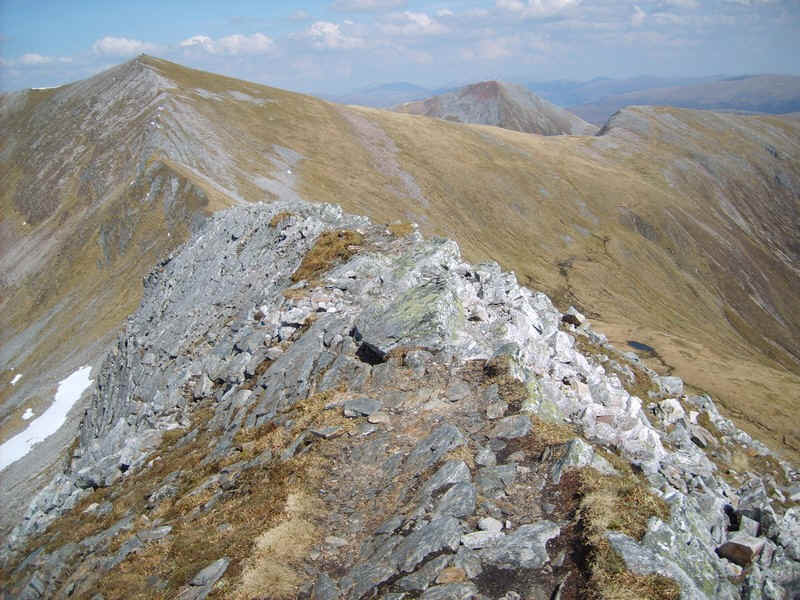 The view from near the summit down into Coire a' Bhinnein with the 943m high Munro Binnein Beag to the left. 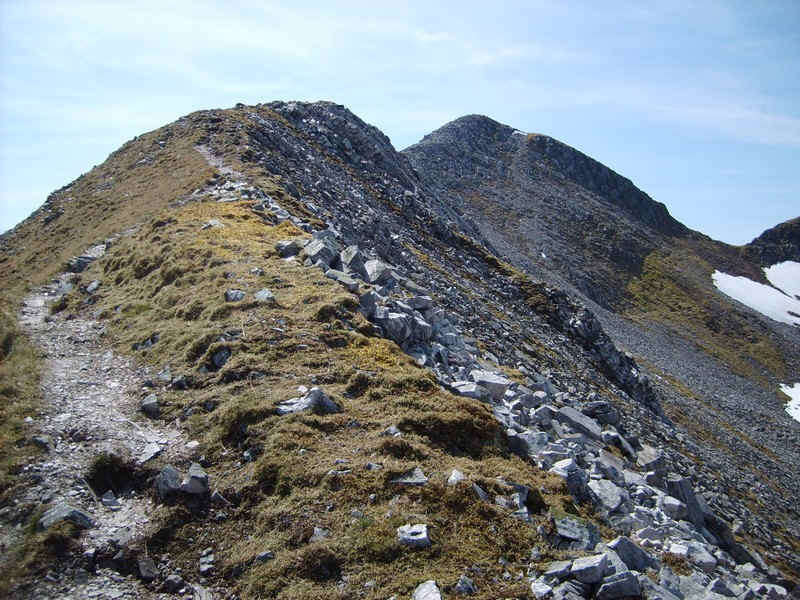 Back at the south top the route on to Na Gruagaichean is obvious, heading straight along the ridge. 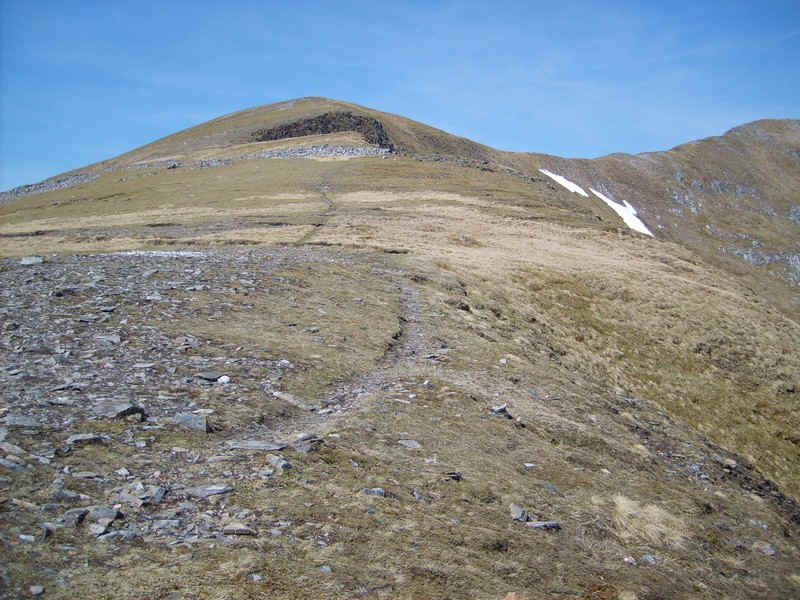 There's a clear path which runs just to the south of the narrow ridge. 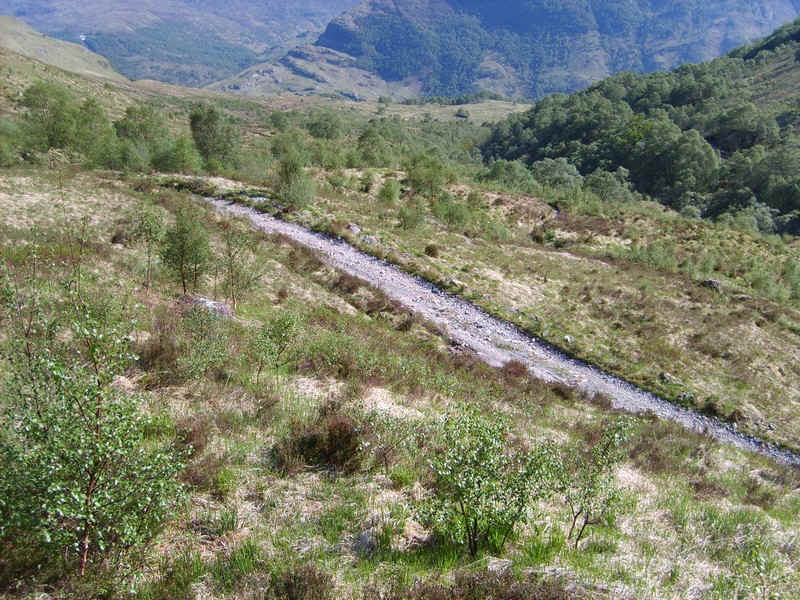 .....but avoids going directly up the crest. 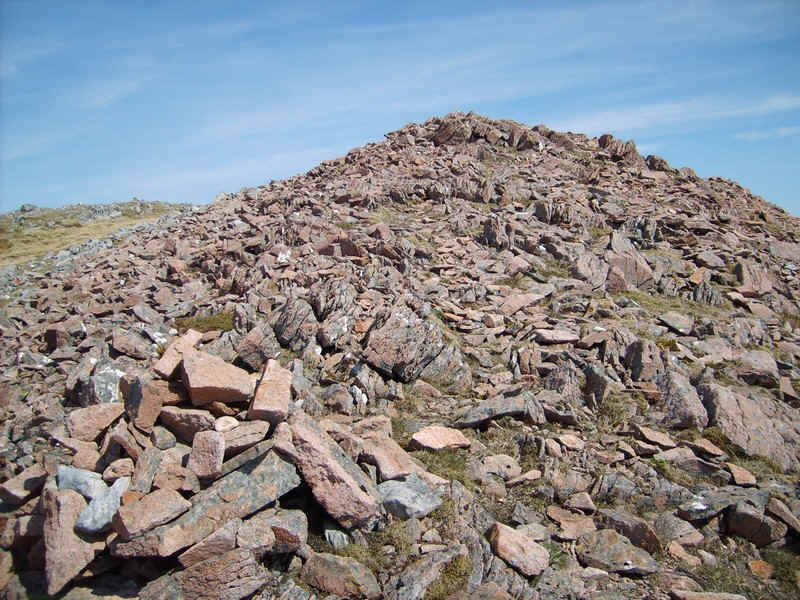 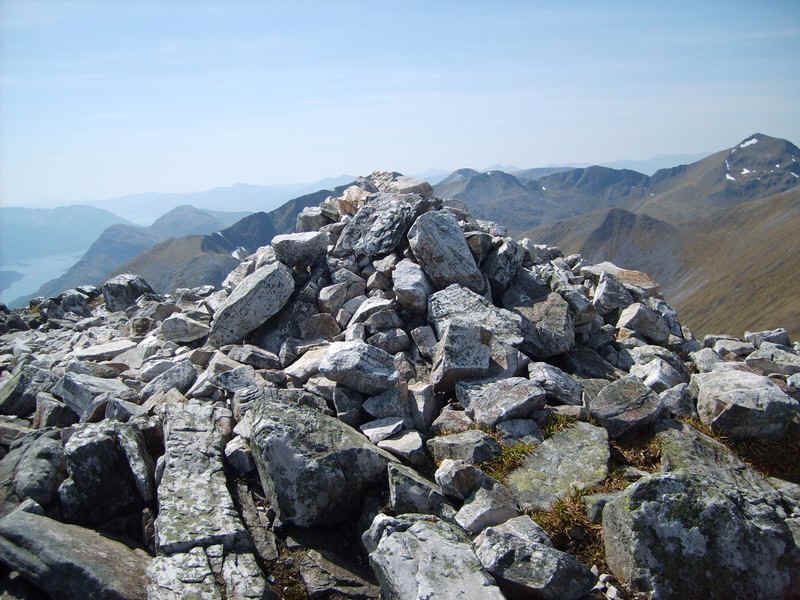 ...to reach the summit cairn. 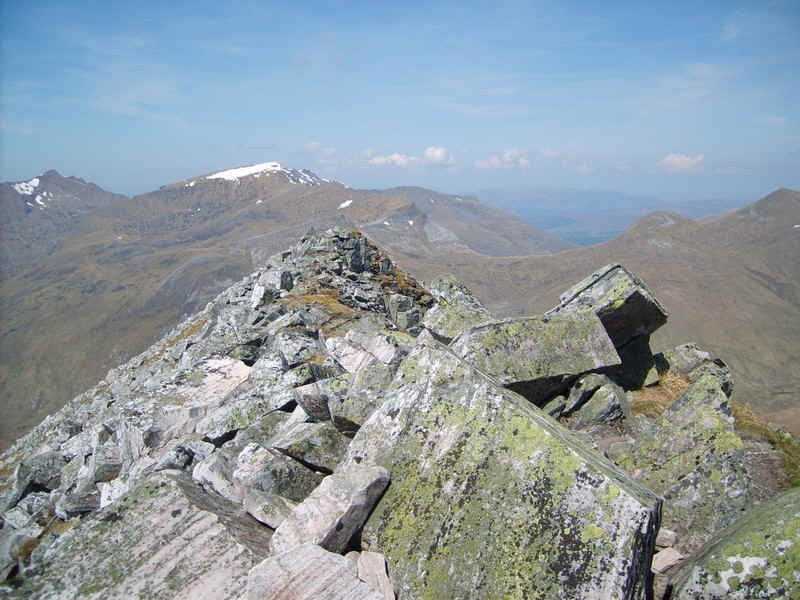 The view from the summit looking back to Binnein Mor. 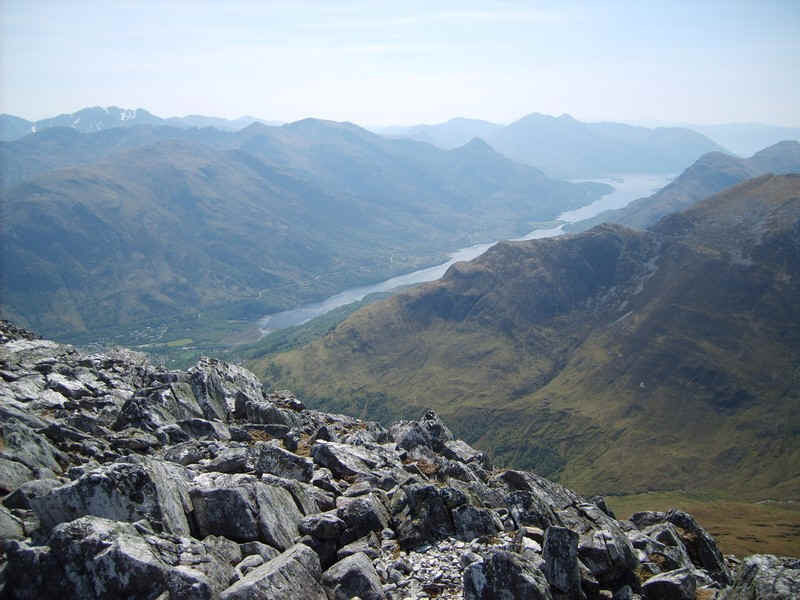 Over to the west is Loch Leven. 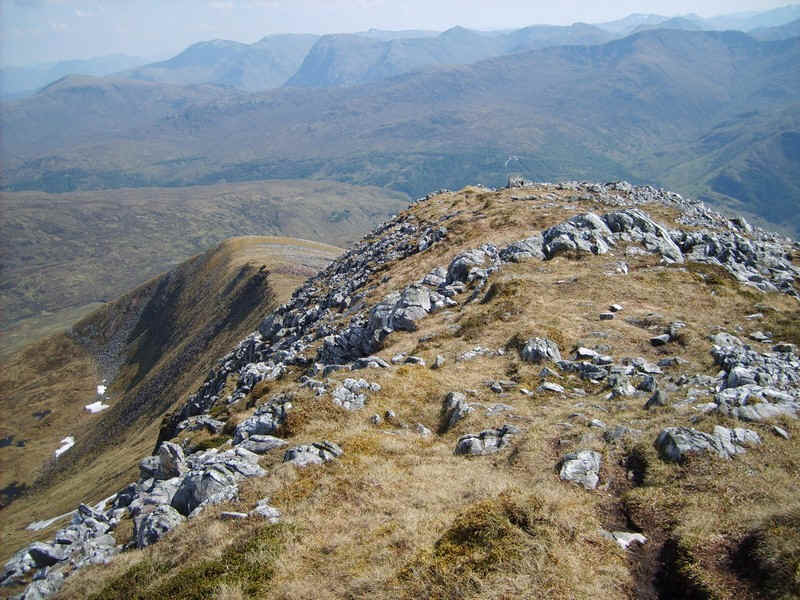 This panorama shows (from left to right) Am Bodach, Stob Ban , Sgorr an lubhair, Sgurr a' Mhaim, Stob Coire a' Chairn, An Garbhanach, An Gearanach and in the right foreground the north west top of Na Gruagaichean. 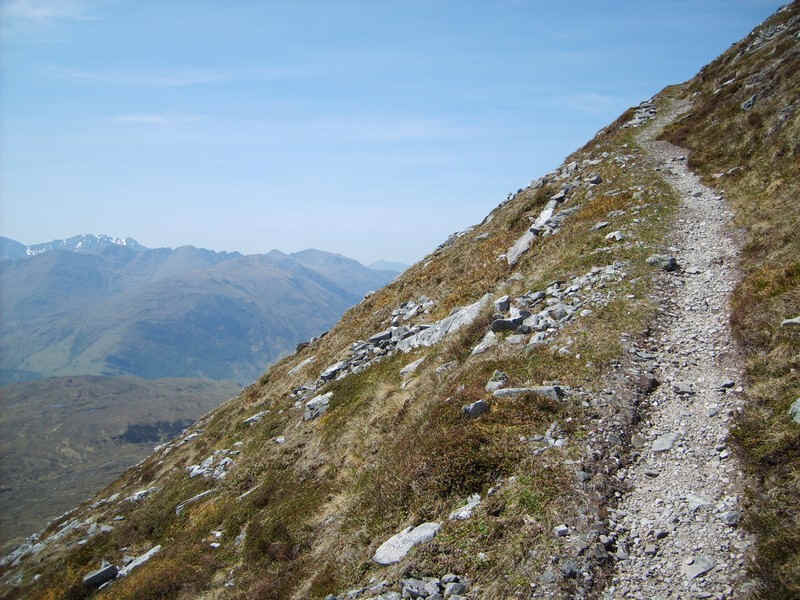 I had thought about returning to Kinlochleven via the outward route but in the end decided to come down the south west ridge to join the vehicle track to Mamore Lodge. 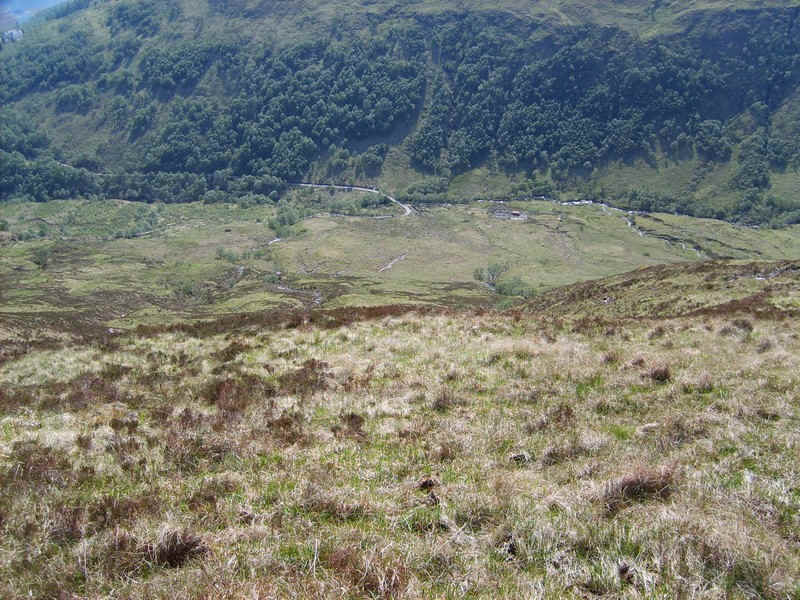 This photo shows the first stage of the route. 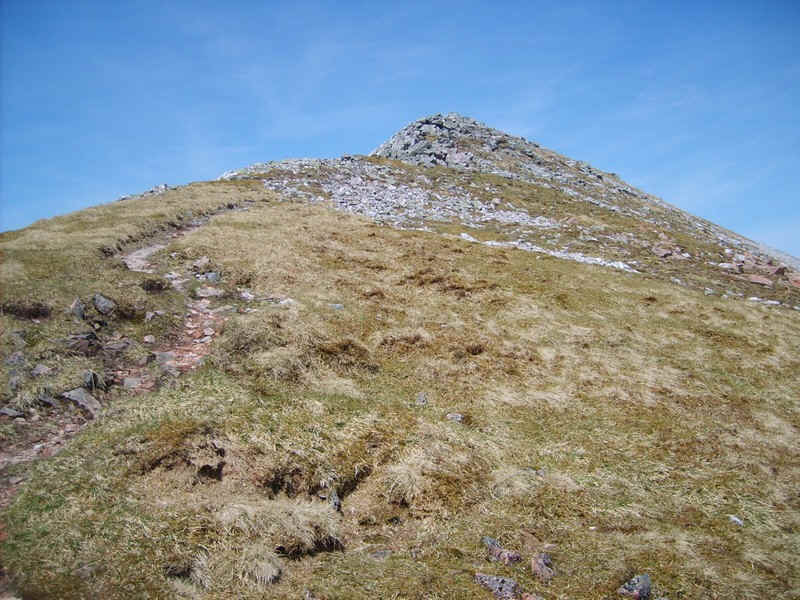 Looking back uphill towards the summit - there was a school group from Edinburgh climbing the two hills and they can be seen on the summit. 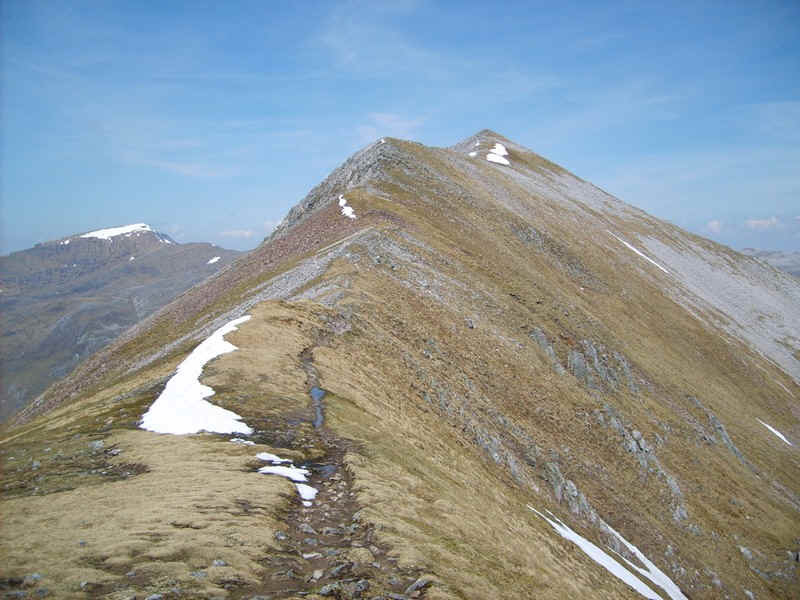 There's a good path most of the way down the first part of the ridge. 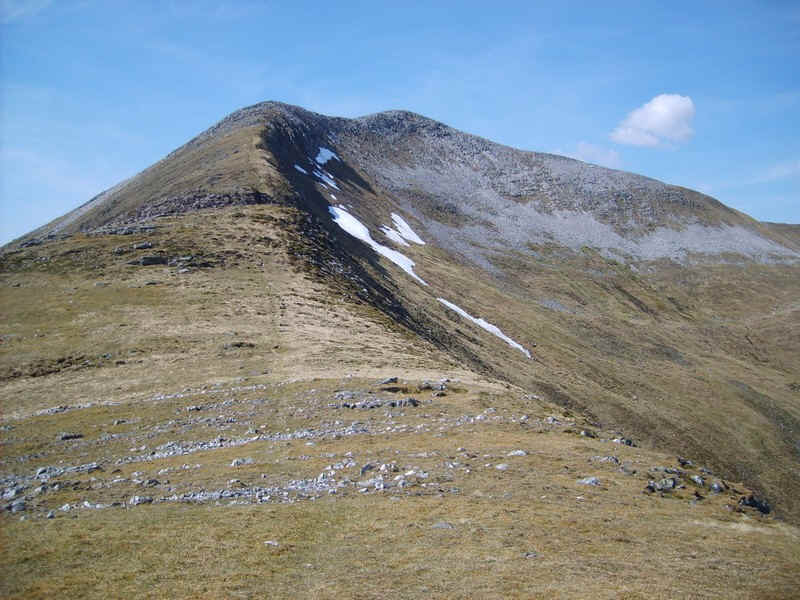 Another view back gives a good impression of the hill's shape. 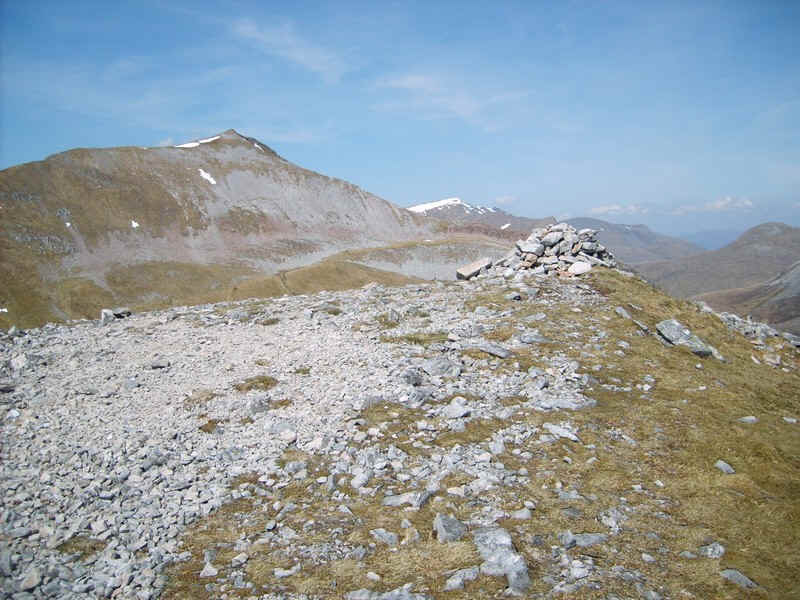 Lower down several cairns indicate turns in direction..
....and they way forward points directly towards Mamore Lodge. 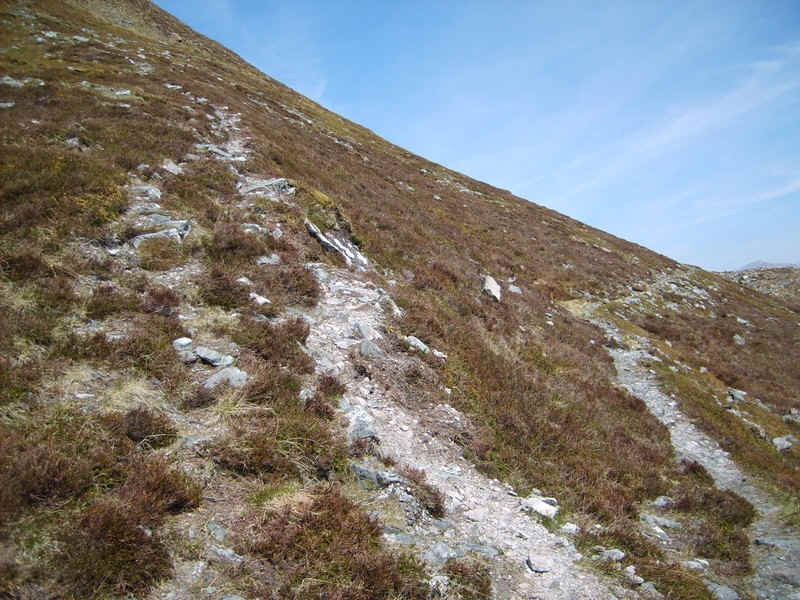 Initially it was a steady drop..
...over grass and occasionally boulders..
....but eventually the track either ran out, or I lost it, so it was a case of heading down to the vehicle track. 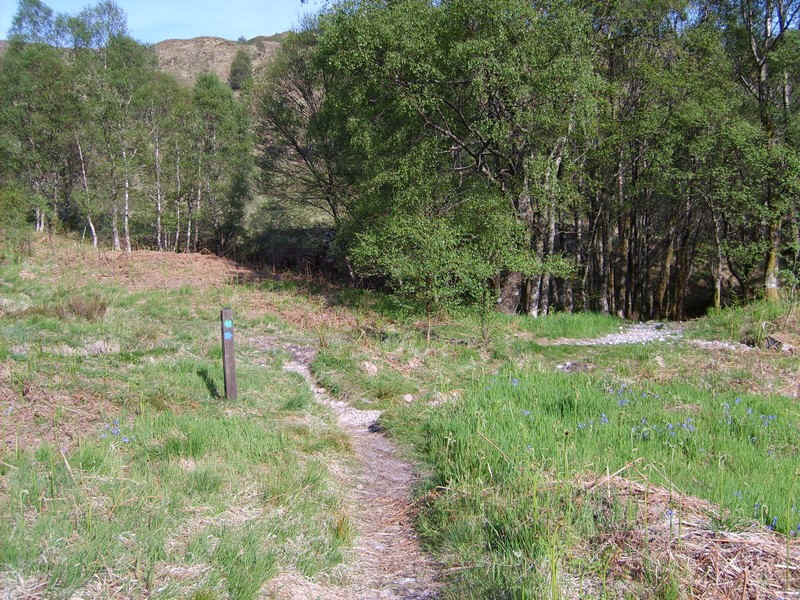 There were some deer fences to negotiate lower down before I joined the track to the Lodge. 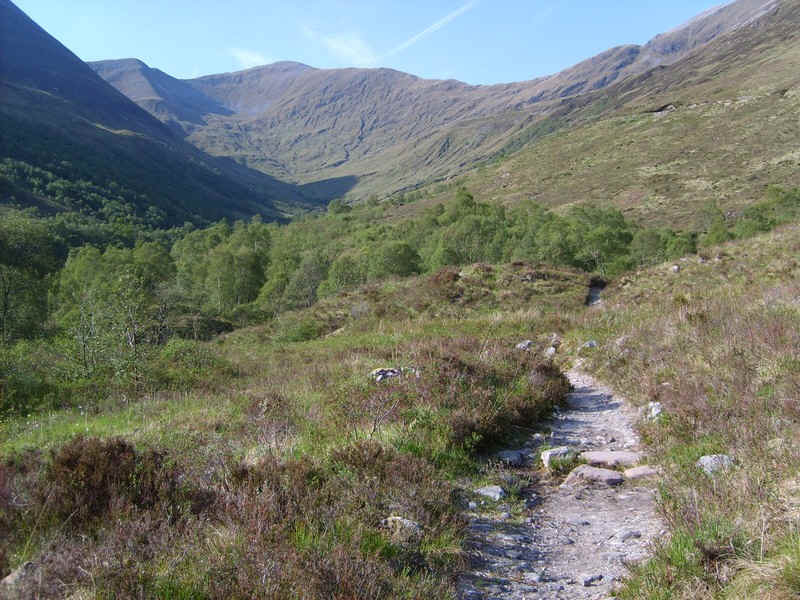 .....over the Allt Coire na Ba..
.....and downhill across the hillside. 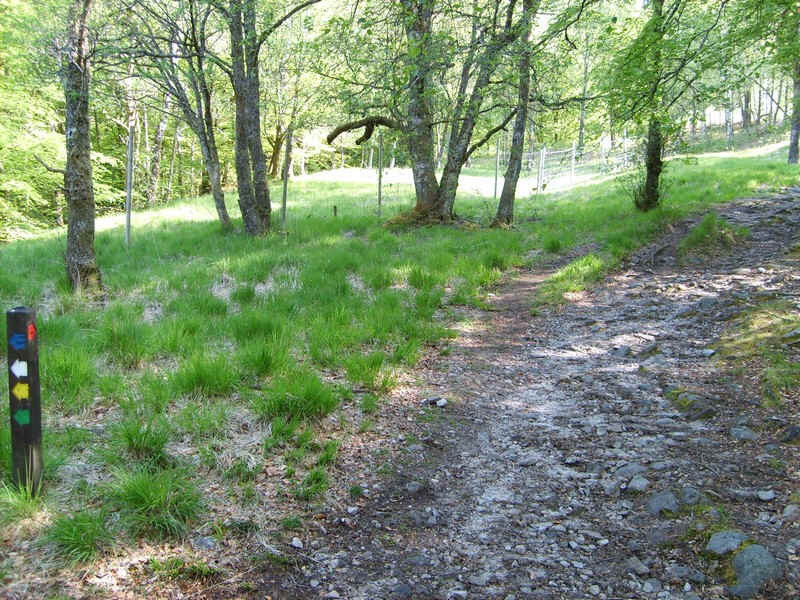 ...and then it's down through the woods. 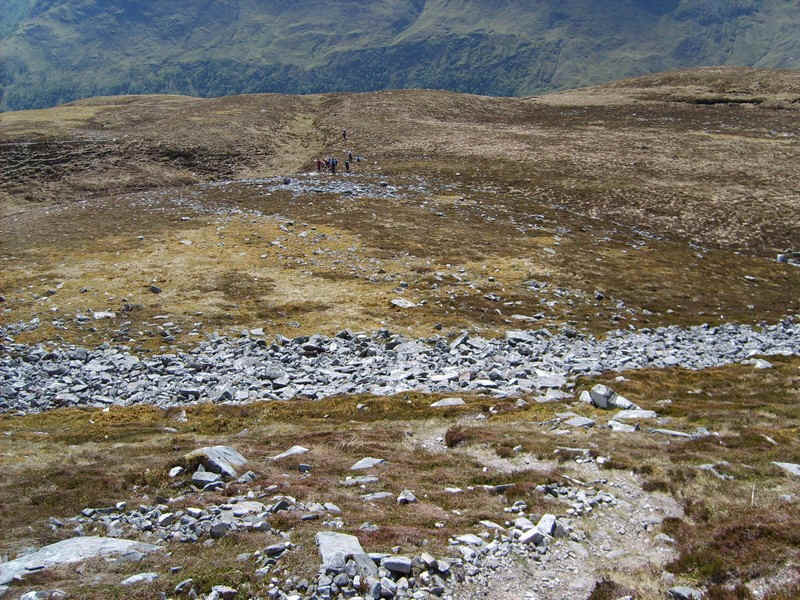 The walk had taken just over 9 hours.